England are out of the World Cup, it’s started raining again and Trump has just landed in the UK. What a difference a day makes. And while most of us take shelter from both the rain outside, the sore heads inside and the continuing political turmoil of both our own government and America’s, there are still some things to smile about. Like this guy, for example, who unwittingly found himself in close proximity of the US president during his visit to London. 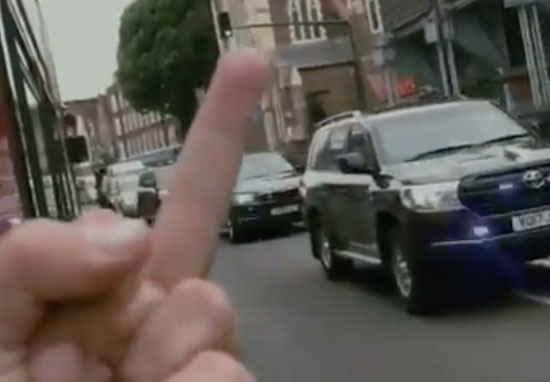 Miguel Santana de Silva, 28, from Kentish Town, London, was waiting for his bus on Camden Road this morning, July 12, when he saw Trump’s convoy (well, it would be hard to miss…) driving past. In the spur of the moment, Miguel simply stood up, raised his middle finger and swore at every car that rolled past. The music is a stroke of genius, too. The finger came up by instinct. As though it’d been waiting for this moment for a couple of years, you know? I know what you mean Miguel, whether it’s directed at a president or not, I think it’s a feeling to which we can all relate. Miguel moved to the UK from Portugal aged 12, and has family in the US, making him feel particularly strongly about Trump. Everything his rotten administration stands for and has done up to, and since [he was elected] has been nothing short of sickening. My mother lives in Nevada and is currently struggling as a single parent fighting Stage four cancer. She’s been in constant treatment programmes – where the bureaucratic battles to stay afloat and insured are a living nightmare. I know for her, the American Dream has been a dying concept ever since reality star Donald Trump took office. Obamacare is literally keeping my mother alive during a very tough battle so it’s honestly frightening when it seems like the bureaucracy holding that in place for her is hanging by a thread. But there’s a sentiment, a fear, and a dejection for those who looked up to America with hope – and of that there is no doubt. While Miguel added that he thinks Trump wasn’t actually in the convoy at the time, it’s a sentiment many people share. [In] the interest of truth and accuracy, I now believe this was the motorcade on the way to pick him up from Stansted. Tens of thousands of people are expected to turn out to protest Trump’s visit to the UK. Plans include a bright orange, giant inflatable Trump effigy flying over the city. Known as Baby Trump the balloon will be taking flight between 9.30am and 11.30am on Friday, July 13. The inflatable will coincide with a ‘Stop Trump’ march in central London.